With so many great films coming out this year, movie themed events are all the rage – here are a few of our top picks! Pirates of the Caribbean: Dead Men Tell No Tales is out this Summer, prompting a perfect opportunity to set the ‘ocean scene’ with our giant galleon, island palm trees and life size pirates. ‘Make Believe’ combines everything your dreams are made of! Giant multicoloured frogs, toadstools, giants, life size talking trees and mystical beasts… tying in perfectly with the release of such films as Beauty and the Beast, and some old favourites too – Mad Hatter’s Tea Party and Fantastical Beasts. ‘Superheroes’ is going to be massive this year and is all about impressive silhouetted cityscapes and vibrant pop art comic book cut outs – pack a punch with this vibrant and powerful theme! ‘Summer Lovin’ combines Californian surf boards, driftwood signs and all things beachy, and is just in time for the new Baywatch film which is on its way! ‘Showtime’ is as big as ever, and with our brand new selection of colourful stalls, games, ferris wheels and our life size land train (complete with sound effects of course), make an impact with your own funfair style event, packed with entertainment. 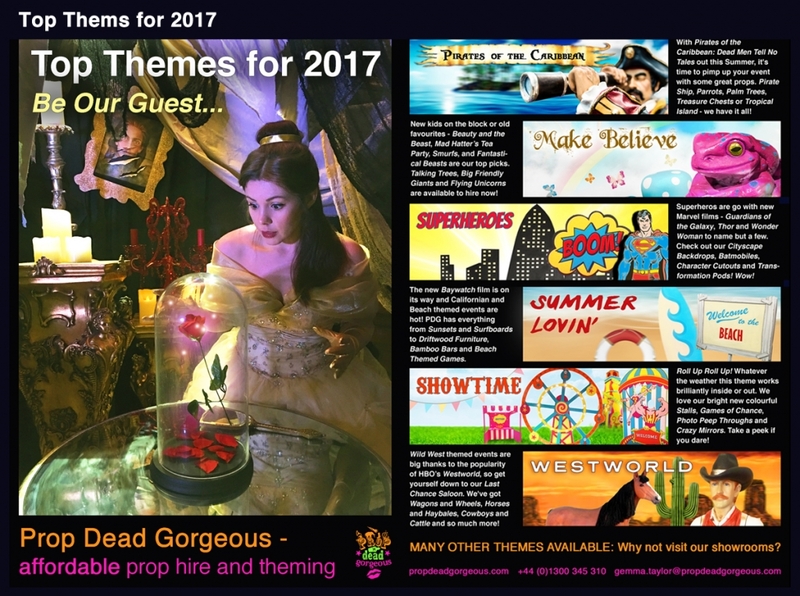 Another big one for 2017 is ‘Westworld,’ and we are bursting at the seams with all things ‘cowboy’… we’ve got wagon wheels, horses and hay bales, saloon doors and cacti, all ready to go!